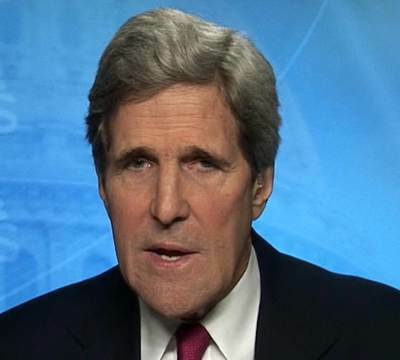 Still, Kerry’s remarks this morning on Meet the Press were a bit much. “It’s really 19th century behavior in the twenty-first century,” Kerry said of Putin ordering Russian military forces to move into Ukraine. “You just don’t invade another country on phony pretexts in order to assert your interests,” he said. Uh-huh. We may have ceded the moral high ground on this one a few years back. 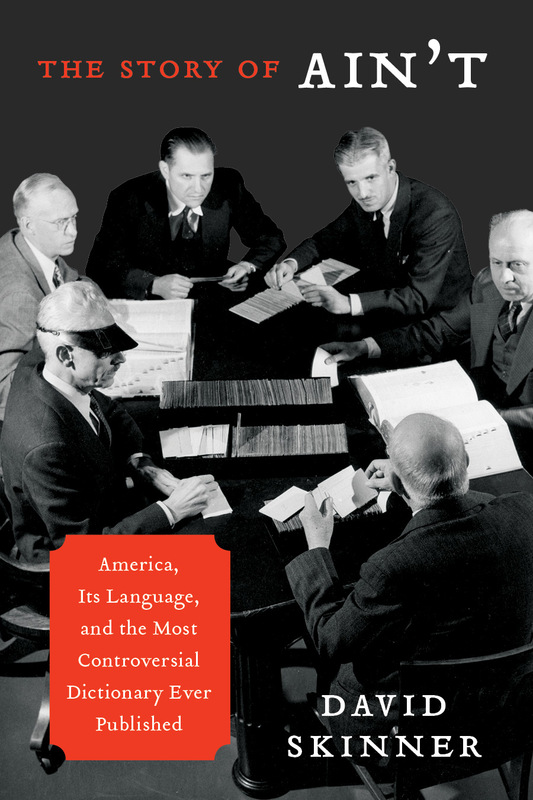 The paperback reissue last month of David Skinner’s The Story of Ain’t: America, Its Language, and the Most Controversial Dictionary Ever Published prompted Language Log’s Mark Liberman to write an enthusiastic post. Next Tuesday, David Skinner’s The Story of Ain’t is coming out in a new paperback edition, with a new epilog. I’m happy to have this occasion to post an enthusiastic recommendation: You should immediately run out (virtually or physically) and buy this book, in any of its editions. I began a similarly enthusiastic recommendation back when the book was originally published, in the fall of 2012. As usual for me, I framed the post around some quotations from the text — but every time I made a selection, I recalled an even better section a bit later, or realized that the full impact of the passage that I’d chosen required some background from an earlier chapter. So my post never got posted. Last summer I taught a course at the LSA Institute in Ann Arbor, and I brought my copy of The Story of Ain’t with me, in the hopes of resolving my dilemma and finally posting a recommendation. One afternoon, my roommate Pieter Muysken happened to pick this book off my desk and sat on the living room couch to skim it. For the next hour or so, Pieter regaled me with a series of variously commented passages: “Listen to this…”, “Oh, this is funny…”, “This man can write…”, punctuated with bursts of laughter, grunts of appreciation, and dramatic readings of selected sentences, paragraphs, or pages. I did, downloading it after just a moment’s pause. The reason for my pause—and I must say, this is a continuing annoyance with regard to Kindle editions—was the realization that despite the existence of a new epilog, my only option was to download the original version. I have yet to see a Kindleization updated upon the publication of a paperback with new material. I started the book that day, but it’s been slow going since. I keep getting distracted by various duties, our never-ending remodel, travel plans, and even another book. I hope to get more focused soon. Here is part of David Skinner description at the book’s website of its origins. Webster’s Second was puritanical and uncontroversial, created for the living room and the classroom. 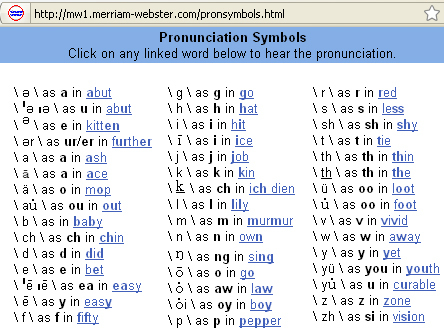 Its pronunciations represented “formal platform speech,” and its pages contained almost no dirty words. It labored to stay on the right side of schoolmarms and grammarians. Webster’s Third was scientific in method and, at the same time, surprisingly current on popular culture. It contained almost all the dirty words and among its quotations were such linguistic authorities as Betty Grable and Mickey Spillane. It had not been designed for either the living room or the classroom. It did not play nice with what Gove called “artifical notions of correctness.” Many people—including a fair number of journalists and literary figures—hated it. Shortly after Webster’s Third was published, the New York Times called on Merriam to take it back and start over. Dwight Macdonald in the New Yorker compared it to the end of civilization. The Editorial Board of the American Scholar didn’t even bother reading it before deputizing Jacques Barzun to denounce Webster’s Third as “the longest political pamphlet ever put together by a party.” Meanwhile, James Parton and the American Heritage Company sought to use the controversy to win a controlling position among Merriam stockholders and take over America’s most venerable dictionary brand. The Story of Ain’t is about the people who made Webster’s Third and the people who loathed it, and all that was going on in the language and in linguistics in the years leading up to 1961. It is a detective story, but it is also a cultural history with an amazing set of characters. I wrote it in order to understand what led to the controversy and why it remains a singular episode in the history of dictionaries and the history of America culture. And I wrote it because I thought it would be fun to sit back and watch the fireworks of a great intellectual controversy. I rarely enjoy listening to NPR Morning Edition’s host Steve Inskeep conducting interviews on political issues. More often than not, when I turn on the radio during breakfast and discover him engaged in such activity, I switch to something else. But yesterday I didn’t, and I was rewarded with an astonishing English language construction. The segment was called Reason For Optimism? Two Sides Talking On Debt Ceiling, and it found Steve talking with NPR’s national political correspondent Mara Liasson about the government shutdown. They were losing. They were just getting battered politically. And here’s a pretty good example of what was happening to the Republican political position. This is a new Wall Street Journal-NBC poll. By a 22 point margin the public thinks the Republican Party is more to blame for the shutdown than President Obama. That’s a bigger margin of blame than the Republicans received during the last shutdown in 1995. The Republican Party is now at record low levels of unpopularity. Only 24 percent of people have a favorable opinion of the Republican Party. The Democrats aren’t doing much better, but at least they have a 39 percent favorable rating and they’re not dropping like the Republicans. And here’s the other thing. The president’s approval rating actually went up in this poll. Read the opening of that second paragraph again. 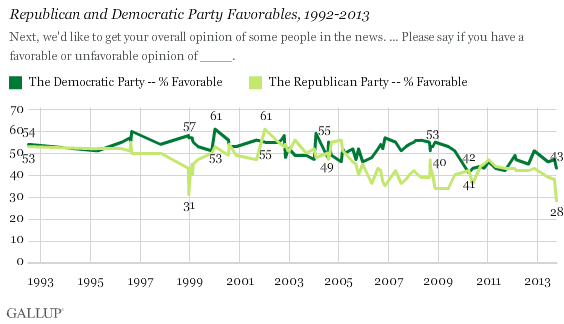 Yes, Mara said that the Republican Party is at record low levels of unpopularity. I thought, oh my gosh, I have to post this. But I delayed. This morning I wrote to Language Log co-founder Mark Liberman to offer the quote as an addition to the mis-negation files that he maintains. Tonight, I sat down to write my post, only to discover that Mark was already on the case. There’s not much to this post. Just a one-sentence quote from a letter to the editors of the New York Review of Books written by Harvard economist Kenneth Rogoff. But I’m going to take some time getting to the sentence, in order to provide context. The context comes in two strands. 1. The first strand is not germane to the point of this post, but it seems only fair that I explain what Rogoff’s letter is about. Rogoff and his Harvard colleague Carmen Reinhart wrote a 2010 paper, Growth in a Time of Debt, that became immensely influential as a source for those arguing in favor of economic austerity policies. Last April, three University of Massachusetts economists published a paper showing that the Reinhart-Rogoff paper had errors in its data and analysis. Controversy ensued. A highlight of the controversy has been an ongoing argument between Reinhart-Rogoff and Paul Krugman, including this letter written to Krugman in late May and Krugman’s response. Mr. Rogoff and Ms. Reinhart seem to have misunderstood the nature of this discussion. I have never attacked them as individuals, and have often praised their earlier work. However, their claim that severe negative consequences follow when public debt exceeds 90 percent of GDP has had an enormous, malign impact on policy discussion. It doesn’t matter whether they themselves are policy hard-liners; the alleged result was out there—and despite important questions raised about their claims from the beginning, they did nothing, as far as anyone can tell, to dissuade others from citing their work on behalf of harsh austerity policies. I’m sorry if they feel mistreated—but this is about policy, not about personal feelings, theirs or mine. 2. 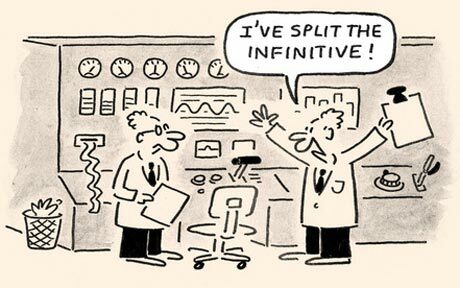 The second strand is the persistence of the rule not to split infinitives in English writing. The nonsensical nature of this rule has been well treated over the years in a sequence of articles by Geoff Pullum at Language Log and Lingua Franca. See, for instance, this and this and this from last June and this from a year ago. I have commented elsewhere on the fact that writers in The Economist are required to write unnatural or even ungrammatical sentences rather than risk the wrath of the semi-educated public by “splitting an infinitive” (putting a preverbal modifier immediately before the verb in a to-infinitival complement clause). The magazine published a sentence containing the phrase publicly to label itself a foreign agent where clarity demanded to publicly label itself a foreign agent. Now to the point of this post, which is to offer another stunning example of the damage done when a writer insists on not splitting an infinitive. The writer is Kenneth Rogoff, the example coming from his New York Review letter. I have already quoted a fragment from the opening paragraph. Here is the paragraph in full. In his review of books by Mark Blyth, Neil Irwin, and David A. Stockman, New York Times columnist Professor Paul Krugman continues his attack on me and Carmen Reinhart. Never mind that only one of the three books even mentions us. This is no obstacle to Krugman’s relentless campaign narrowly to circumscribe and grossly to misrepresent our research and its influence. His goal seems to be to paint us as extremists whose work is only referred to by conservatives. In reality, our long-standing position has been as centrists in the economic policy debate. Narrowly to circumscribe. Grossly to misrepresent. How dare he! The summer of limited blogging continues. Between work, remodel, and social events, I see little room for improvement. Prior to the past week, we’d been to four weddings in a two-week period, plus a sixtieth birthday party. This week brought a retirement party and a wedding tripleheader: rehearsal dinner Friday, wedding Saturday, post-wedding brunch Sunday (today). All of which was wonderful, but not conducive to blogging. The bride is the daughter of good friends, and the officiant was Gail, which put us in the middle of the action. Gail anyway. Me, not so much, though I did get to observe, and to meet a lot of fascinating people on the groom’s side whom I may not see much of again. But for three days they were constant companions. There’s the groom’s aunt from Fort Worth, and her husband, who runs the business side of a large university down that way, which means—when we found ourselves sitting side by side at the wedding reception last night—that we ended up having a lot in common. Especially beef, as it turned out. They’ve given it up mostly, in favor of fish, chicken, and a healthier diet. But they talked about ribeye steaks and barbecue in the most enticing of ways. I had previously wished to visit Fort Worth in order to see the Amon Carter Museum. Now I want to drop by their place for the ribeyes, the barbecue, and steak fajitas. Also for a piece of golf history, as the uncle took golf lessons in his youth from the famed golf pro atColonial and lived near Shady Oaks, where Ben Hogan ate lunch and played golf for decades. Plus, the aunt’s storytelling. She’s quite the monologuist. At the rehearsal dinner the night before, she gave such detailed descriptions of Fort Worth summers that I was sweltering. I could continue running through all the people we met and what I learned from them, but maybe I shouldn’t. There is of course the bride’s aunt, whom we’ve met before, and uncle, whom I talked with last night (as I did last September) about their vineyard. It turns out that tomorrow is the day that Quilceda Creek Vintners up in Snohomish makes their latest releases available online for purchase, so I especially enjoyed getting his insight into them and Washington wineries in general. Plus—small world and all that—today I talked shop with their daughter the math grad student and her boyfriend the fellow math grad student. I don’t see mathematicians at too many weddings. Well, except weddings of mathematicians. Speaking of small worlds and coincidences, we got to talking with the groom’s father towards the end of the rehearsal dinner at his home Friday. Well into the conversation, when he asked about our kids, it emerged that the groom and Joel were born the same day, a couple of hours—and a few states—apart. They even went to the same school, but not at the same time, the groom leaving before Joel arrived for middle school. This is where the homophone pair enters. Dinner consisted of an orzo salad that the father’s wife later told us is from The Herbfarm Cookbook, a fruit salad, some other things I’m forgetting, and excellent salmon cooked over a large grill. The bride’s father had mentioned earlier that he had been out fishing with the groom and his father the day before, but caught nothing. Now we learned from the groom’s father that he and his son had in fact caught the salmon we ate earlier. 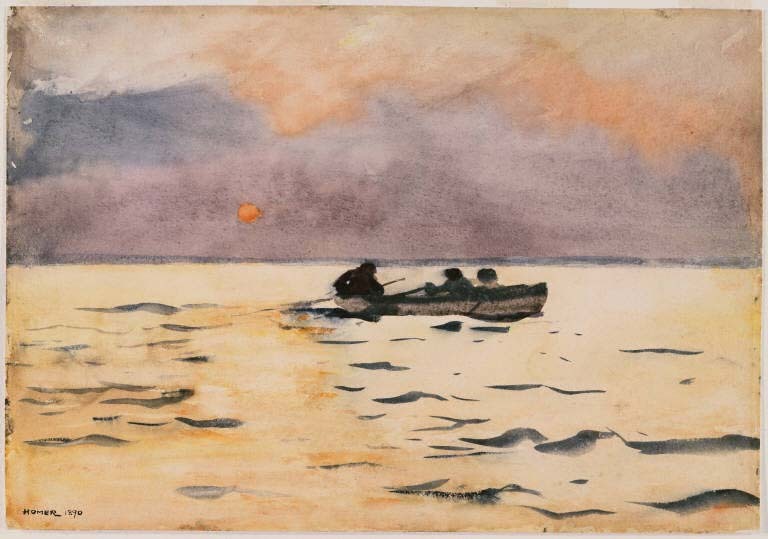 I imagined them in a powerboat, but as the father began to describe the outing, he said they they “rowed out.” I had to change my image from powerboat to tiny rowboat, with father, son, and bride’s father squeezed in. Next he said “in the car.” They “rowed out in the car.” Huh? Not powerboat or rowboat but car? This image didn’t work. Something was wrong. Time to re-parse. Ah, they “rode out in the car.” That’s it. They weren’t in the water yet, they were on their way. That made more sense. I found my confusion sufficiently interesting that after the father finished his story, I shared my confusion with him, Gail, and the bride’s mother. Now I’m sharing it with you. I may as well get one post out of this weekend. The wedding? It was beautiful. But that’s another story. 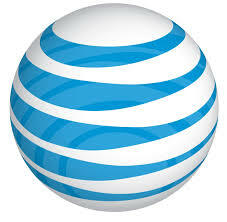 I’m thinking of changing the name of the blog, thanks to AT&T. And then Mike began the concluding paragraph with unexpected intimacy. In all, I truly appreciate you being our customer, Ronald S.
How did he know that that’s what my closest friends call me? Now that the word is out, I may as well adopt the moniker for the blog. I would infer that the algorithm used for this line in the letter is to take my account name—which is used in the postal address at the top and in the salutation—and truncate the last name. Thus, when the time comes for intimacy, Bobby Joe Smith would be addressed as Bobby Joe, and Leigh Anne Jones as Leigh Anne. You wouldn’t want to err by calling Bobby Joe just plain old Bobby, or Leigh Anne just Leigh. Perhaps AT&T should revise the algorithm to drop penultimate names that are one character long. That would save some tone-deaf intimacies. Better yet, of course, would be to omit the phony intimacy altogether.